The photo prompt for this week is another one that’s tough to illustrate in a cemetery. I want to write about Seattle’s Lake View Cemetery for tomorrow’s Cemetery of the Week, so I’ll stick close geographically, if not in the same immediate grounds. 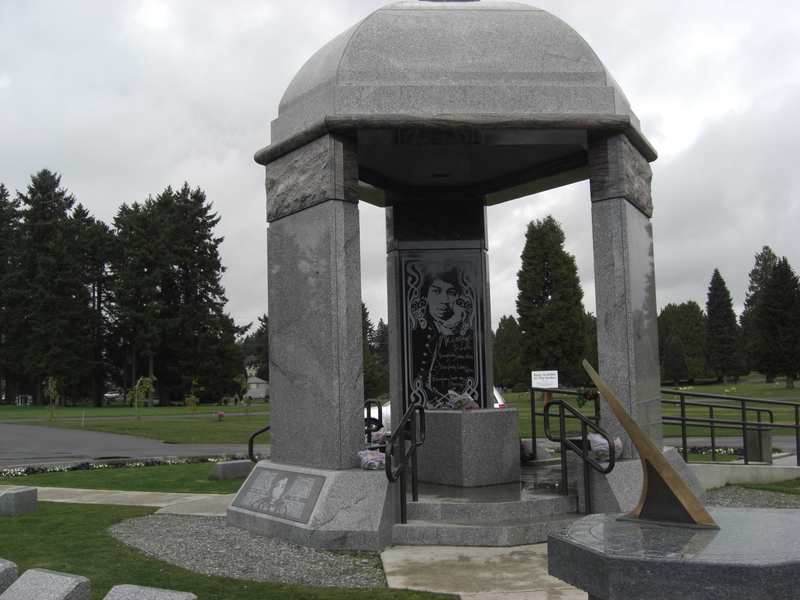 During my trip to Washington in February 2009, I wanted to visit Hendrix’s grave because his guitar-playing was so influential for my husband. We were staying with two musician friends in Seattle, so they were kind enough to chauffer me out to Greenwood Memorial Park in Renton. The weather was chilly and gray, but the rain held off while we poked around. I didn’t immediately recognize that some people might find such a thing unusual. I’ve been going to graveyards so long that it’s second nature. I always seek out graveyards when I travel. Even at home, I may spend as much time in graveyards as I do in the park. If I have some time on my own to kill, I often find the closest graveyard to explore. At least my hobby gets me outside. This entry was posted in Photo Challenges and tagged cemetery photographs, Greenwood Memorial Park, Jimi Hendrix's grave, photo of the week, postaday, postaweek2012, Seattle cemetery, Washington cemeteries. Bookmark the permalink. I understand completely – I’m often fascinated by the hidden stories and history in graveyards. I think that’s what fascinates me the most: that there are stories I will never know completely. Cemeteries are full of mystery. Thanks! This one was hard. My photo doesn’t really do it justice. It was just a drizzly morning. The stone doesn’t really shine. Well, the long answer is in my Welcome to Cemetery travel here. The short answer is that cemeteries are a microcosm of the communities they inhabit. You can learn a lot about people by the way they treat their dead. And they’re beautiful, peaceful, full of plants & animals & insects — and lots of food for thought. Thank you for your answer. I admire people doing anything for their soul whatever they are interested in instead of selfpity and talking all day about their dreams while they sit at home. Interestin point of view! keep on. Thanks so much for the link, Liz. I’ll go check it out. And thanks for your thoughts, too. I wish I’d photographed my brother’s flowers at the graveside. It would help now to remember how much he was loved by others.